There are restaurant lunches ruined by the restaurant themselves, and there are restaurant lunches ruined by the diners, and then there are restaurant lunches when everyone contributes to the disaster. I feared that planning a lunch for a very finicky and health-conscious relative would end into one of the latter. My tita who would be coming back home soon from another country have asked me to take her to a good restaurant in a mall with a lot of restrictions. First the mall should not be crowded, also, the restaurant has to serve above all good quality dishes that are not Filipino in taste, finally, the restaurant has to be organic. Poor food-blogger me. Sometimes friends and relatives think of you as the maven when it comes to dining out. Can you imagine the pressure? Nonetheless, I'm enjoying the limelight. What's so good about being a foodie is meeting a fellow foodie who happens to know the ins and outs of the dining scene, being adept as well in his skills in food photography and marketing. I'm talking about Ace Azarraga, whom I'm so thankful of for giving me a chance to have a glimpse of a fairly new restaurant in Eastwood mall. 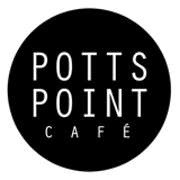 Potts Point Cafe happens to be in a mall that is not crowded and is a restaurant serving organic food. Now that definitely answers my woes. However, would it qualify for my tita's standard as healthy, better tasting organic food. Good thing I was able to sample some of their offerings. The cafe happens to be where Swensen used to, which is at the second floor of Eastwood mall, with an ample seating inside the cafe and outside. It is also owned by the company which Swensen and TOSH belong to. Though, I have never questioned why my tita went organic, or natural or part-vegan, I am still in doubt whether it would be welcomed by regular diners. Well, why not? Eating organically grown foods is the only way to avoid the cocktail of chemical poisons present in commercially grown food. According to OPTA (Organic Producers Trade Association), these crops that are produced under modern agriculture techniques that use large doses of pesticides, herbicides and fertilizers are decreasing brain size, thus slowing down one’s intelligence capabilities. OPTA also tells that international studies have likewise shown that chemical-infused crops are the major causes of cancer, hormone disruption, neurological disorders and other life-threatening illnesses. As chemical farming destroys the environment, OPTA says beneficial micro nutrients in the soil that are needed by a human body are also killed such as calcium, magnesium, iron, zinc, copper, selenium, manganese and many others. The absence of these essential health elements in the planting grounds may cause malnutrition as the soil can no longer produce foods that are adequately supplied with important nutrients. So there, this would probably give you some thinking, while I say the same to myself. Potts Point, btw, is a place in Sydney, Australia which happened to also influence the development of the whole restaurant's concept, including the menu. You can either love or hate their shabby chic interior. The walls are made up of used and distressed wood planks, on the middle however is a modern open kitchen elevated and fancied with expensive white tiles. I somehow find it a bit masculine than girly shabby chic. I like that they are not too flashy pretending to be very foreign. Their choice of brews, Delano coffee, also were sourced from Australia, they are certified organic. I love it when I see salt and pepper grinders but this time is disguised into shakers. On the right side of the photo is a pink Himalayan salt rocks. The cutlerries and napkins were placed on a mason jar giving it a quirky and country manner. To say the least, many attested that organic veggies taste better than non-organic ones. The Organic Sausage and Bacon Pizza Salad with Raspberry Vinaigrette (P 275) confirmed that. I hope the photo can justify the freshness and crispiness of the rockets and icebergs. Listed under salad, the bunch actually is sat on a very thin crust layer, initially I thought it was papadum, for it was savory. Having it with raspberry vinaigrette is innovative making it stand above the rest of the salads. They have other similar inventive salads which you will surely enjoy as well, as how I did. Wouldn't you want to wake up in the morning, smelling the aroma of bacon and eggs being cooked? Ahh, how about being surprised with a serving of eggs benedict on your breakfast table? That's heaven on earth, would you agree? At Potts Point they too serve an array of well-loved English breakfast fare, like the Eggs Benedict (P 385). To begin describing this plate, toasted crumpets, organic bacon and poached organic eggs were layered and smothered with Hollandaise sauce. Crumpets are soft and spongy griddle cakes made from flour and extra yeast. Eggs Benedict may be served with an English muffin or French Toast, but for a more pleasurable dining, they opted to have it with crumpets. Moving on to the Entree, we had Pan-Seared Salmon with Dill Butter, Beet Root Puree and Creamy Mashed Potato (P 495). This had been my top favorite for this afternoon try out. Let me deconstruct everything for you to explain why this had been my top choice, Oh and does that rich red sauce just catches your attention? Aside from being more than healthy, because it's fish, the myriad of flavor and texture playing in your mouth simply would trigger comfort and gladness (like in a song). The salmon, seared on a pan was glazed magnificently with dill butter with a hint of lemon, then topped on a soft and fine mashed potato. The hericot verts and beet root puree added splashes of colors resembling a a painter's palette. I got a little "bitin" with the mashed potato, if only they could have slathered a little bit more. Another canvass on a plate was served. This time it's a pasta dish, but unlike your average go to pasta. The house-made pasta is infused with squid ink and is tossed on aglio olio. The Squid Ink Spaghetti with Cherry Tomatoes, Parmesan Shaves, Arugula and Fried Calamari ( P 285) had been the talk of the table, for anyone who devoured it left a rather dark mark on their lips, their tongue and their teeth (hahaha), literally! But fret not, eating away other food on the table will remove the black stains from the squids' ink. The dish, I regretted not being able to try is the Vietnamese-Style Organic Slow Roast Pork Belly with Nuoc Cham (dipping sauce) and Pineapple Fried Rice (P 375). Another must-try according to my fellow foodies on the table, though it already had me with pineapple on the fried rice. This place is a haven for pasta lovers. If however you are not adventurous enough to try the squid ink pasta, perhaps this plate of Linguine with Roasted Eggplant, Cherry Tomatoes and Goat Cheese with Creamy Organic Tomato Sauce (P 275) can best satisfy you. If you're having your afternoon tea, let me suggest their French toasts to go with it. Above is strawberry filled toast served with a beautiful clotted cream and organic honey. The Strawberry, Kiwi and Ricotta Cheese Crumpets with Organic Honey and Hot Chocolate (P 220) seemed to be smiling at me. For a savory toast treat, why not go for Grilled Three Cheese Toast with Creamy Organic Tomato Puree Dip (P 230). I never realized we can have our cheesy toast with a dipping and a tomato based at that. It actually worked pretty well. If you think they are heavy on organic meals and have weighed less on cool beverages, you'll be surprised to see their menu. Another healthy and wellness trend have captured a particular sect of foodies. Juicing fresh fruits and vegetables have become more than just a snack treat. It has evolved to become a complete nutritious meal on its own. I had the Watermelon, Kiwi and Mint Juice. The watermelon also does the punch. I like that they don't put anything else to sweeten it. The sweetness come from the fruit itself. It's not also too minty so if you feel that the mint might over-flavor it, it didn't, only a mild minty flavor can be tasted on every sip, however I can't seem to find the taste of kiwi on this glass. They also serve milkshakes and smoothies. On the left is a concoction of chocolate milkshake and peanut butter, while on the other side is the one with banana, oatmeal and organic cacao nibs. If your teeth are ready to be engulfed with saccharin goodness, the Warm Caramel Walnut Pie with Tyme Vanilla Ice Cream (P 210) will sure to captivate you. It's a pie served warm drizzled with golden caramel syrup and over-layed with caramelized walnuts . A dollop of ice cream sat next to it looking gingerly pretty with some streusels. The Oozin Ozzie Chocolate Cake a la mode (P 245) ended that meal for me. I can't really tell whether it's a lava cake or a souffle. But when I dug into it, I noticed how cakey with a bit of mousse-like texture appeared on the outside while a gooey warm chocolate oozed out from its center. I reckon it uses the same recipe as my Two-minute Chocolate Cake. Pronounced as "try-full" in English, trifle is a dessert made up of layers upon layers of cake, custard, cream and fruits. Served in a shot glass, Potts Point's Strawberry, Kiwi and Mango Trifle (P 185) is simplicity embroiled in a drama of taste. The whole confection toppled in an unctuous heap when spooned in a single act, having the light vanilla custard and cookie crumble amorously blending with the tart-sweet fruit juice which had bled from the fruits. When I thought the chocolate cake ended my meal, I was discerned for this has to be my choice of dessert. It is safe to say that 80 % of all of the ingredients that comprise the dishes are organic. Knowing now that eating organic can be both beneficial to health and the environment, foodies can now have a better choice in dining out consciously healthier. With a cadre of recently opened organic restaurants in Manila and with the addition of Potts Point Cafe, discovering exciting ways to bend nutritious ingredients to delicious ends can be beyond comfort means. Well, organic farming is a way lot harder to use than traditional or with modern ways tending with pesticides and chemicals. It's also hard to get OPTA accreditation, so explained by a farm owner friend who tries to do organic farming, that is one reason why the produce are more pricey. However, taste-wise and presentation-wise it's just leveled with the food's quality.